History comes alive at Clark Gardens with new interpretive displays! The Clark Gardens Historic Tree Trail is truly one of a kind. The trail, one of the largest in the United States, is home to 86 historic trees, ranging from a Weeping Willow which shaded Napoléon's grave site, to the Berkeley Plantation, the ancestral home of all Americans, Sycamore, to a tree from Graceland, Elvis Presley's home. Other trees represent the Revolutionary War, Civil War and World War II. Trees honor our countries' literary heritage including Mark Twain, Harriet Beecher Stowe, Edgar Allen Poe, and Alex Haley. Famous people and places including John F Kennedy, Lyndon Baines Johnson, Dwight D. Eisenhower, Clara Barton and Juliette Gordon Low are among the famous people represented with a tree. Grown from a seed or cutting by the American Forest Historic Tree Nursery, each tree is a direct descendant of the original. Many of the historic witness trees are no longer living, having succumbed to old age, weather damage and development. The trees at Clark Gardens were planted 12-15 years ago and have grown to be substantial trees. 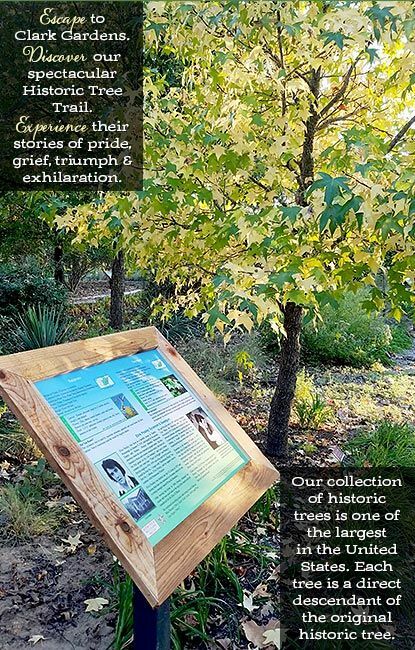 With a grant from the Brazos Foundation and a donation by Mac Shafer, Clark Gardens Historic Tree Trail recently installed informative, interpretive displays for each tree. The displays inform the reader of the type of tree, type of foliage the tree has and the historic significance of the tree. Future plans for the tree trail include audio tours providing the visitor to learn even more about the trees. As you stroll along the Historic Tree Trail paths, you may read imagine and learn as each tree's stories unfold. Imagine how it must have felt to be part of history in the making.